When did you decide this was going to be the end of your time with the show? LI: It was literally two weeks before we finished shooting. It was a decision of self-preservation that just happened. There has been a lot of reporting because I haven’t ever spoken about it. It was painful that there were reports that I was leaving the show for greener pastures, or that somehow I had outgrown the work I had done, which is not the case at all. Nobody loves the show more than me; nobody worked harder on the show than me; nobody put into the show more than me. That’s a fact. I was confronted with having to make a decision to take care of myself, and I did that. I’m really grateful to MTV that they let me leave, that they let me out of my contract (which wasn’t done), and I’m grateful to them not only for putting the show on the air and giving me the opportunity to have the best job I’ve ever had, but also to let me leave when I needed to leave. When the decision was announced, you posted on The A.V. Club that the third season finale was both a “personal opus” and “a love letter to the fans.” When you started writing the show, did you imagine that those two things would be one and the same, and that you’ve develop such a strong connection with the show’s audience? LI: It was so organic. I am an incredibly emotional person, probably too emotional. I am really transparent, and I wear my heart on my sleeve; if you know me, you know I cry all the time. My blessing and my curse, I would say, is how much I expose myself. And yet I don’t know how to be any other way, or write any other way. Once I let the wall down in the last seven years or so, I started writing from a very truthful, vulnerable place, where I just expose myself. And the show is really the first thing I wrote that I was afraid of, because it was so vulnerable. It was such a vulnerable idea that this girl has an incident that could be construed as suicide, as my life has been touched by suicide in so many ways both in my family and with close friends. And I never wanted to do a disservice to how seriously painful that subject was, and I wanted to shine a light on the fact that sometimes being a teenager makes you feel like you want to die. So it’s this awesome metaphor, and I thought it would be so funny to have this character who just wants to be visible who becomes visible in the worst possible way. When you’re putting yourself on the line like that, it would seem intimidating to dive into social media the way you have at times. What drove you to get involved, for example, commenting at The A.V. Club this season? In the end, it was such a gift that the show became so personal to so many people, and I would hear stories: a good friend of mine told me—when I had quietly told some friends I was leaving the show before it became public—a story of one girl who had tried to commit suicide who was afraid to go to school, and her mother showed her the pilot to Awkward. and it got her back to school. And I just think about that and think it’s incredible. A number of A.V. Club commenters shared similar sentiments in recent weeks, and I imagine Twitter users might do the same. That being said, at the same time, social media is also a priority for networks in terms of promotion. Did you feel any tension between engagement and the “business” of social media? LI: It’s amazing, because from developing the pilot to making the pilot to getting the pickup and making the show, this has been a five-year process. It’s interesting what has happened in those five years in terms of social interaction with shows—it sort of happened while the show was going on, and became something that is really talked about: kids tweet it, and it’s a big social media show, which is a lot of why the show has become business and big business for MTV. That’s sort of a weird contradiction, when you think about it: social media allows it to become more personal, connective and real, and yet it’s been co-opted as a space for business where it can be monetized and promoted. LI: On the one hand it’s what brought the show success. This show was not heavily marketed in its first season, it was a grassroots movement where fans took ownership of the show and turned it into something people are talking about. That year it was this amazing surprise little hit that was on Top 10 lists—that was crazy. It was incredible, and it became a show of the fans, which I love. It was definitely embraced as something that was discovered and embraced by the viewers who knew about it. When you have this social media, though, with Facebook pages and comments, kids are going to comment, and for me it’s just awesome and interesting to read: I value every bad comment as much as every good comment, and it doesn’t penetrate with me. But the powers-that-be suddenly pay attention, and they really want showrunners—and this is not just in my experience but also across the board in town—to pay attention. “This is what the fans want.” That’s not true: sometimes fans don’t know what they want. And if you’re telling story based on what a fifteen-year-old is expressing on Facebook, then you take out the journey of the creative, and the journey of the showrunner, and the people who led you there in the first place. It’s a blessing and a curse what’s happened with social media: it’s awesome and I wouldn’t change it at all, it’s just that the people at the top are still trying to figure it out. It’s both that audiences expect to be more involved and that the networks want to make audiences feel involved, a task that is not always the most natural for the people actually making a show. 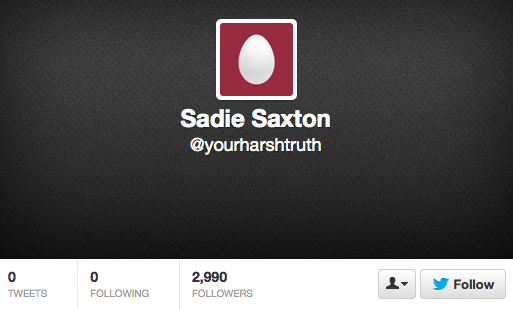 Sadie Saxton’s diegetic Twitter account, registered but never used during the series’ third season. LI: I have to say MTV has an extraordinary social media team—they were one of my favorite departments. They’re awesome: they have such respect for the creative process, for me and my team, and never treated us with anything but the most respect. And with it they became such an awesome creative partner, figuring out different ways we could engage with fans and get them to be part of the process. It was a conversation we had with them regarding Sadie having a real Twitter account, and having Molly Tarlov tweet as Sadie since she’s brilliant in her own right and really funny, and it just never came to fruition. That wasn’t their fault: I left, it was last minute and no one saw it coming. They have found different ways to try to manage the expectations of the fans and also include them, and I think it’s a really hard job that MTV’s team is top notch at. Outside of the social media team, how would you say the culture at MTV changed over the course of the five years you were working on the show? Reflecting back on the five years as a whole, what surprised you most about the experience of telling your story? LI: I had no idea how much telling this high school story—how making the show in general—would challenge me fundamentally as a human being with relationships, and how personal it felt. People always say it’s not personal, it’s just business—it’s not true. It’s always personal when you’re doing anything artistic, and anybody who says anything different isn’t an artist in my opinion. Whatever you do, whether you’re literally behind the camera, or painting the sets, or in front of the camera bringing a character to life, or bringing that character to life on the page, it’s all very personal. I think the hardest thing I didn’t anticipate experiencing was how difficult it is to be the manager of all these incredibly talented, creative people. When you are the boss you get the praise and you also get the criticism, and you’re the first one that people attack, and I wasn’t prepared for that. The decisions I made this season with the character have been so heavily criticized, when I felt like “Give me a chance to show you my show, and tell my story.” You get so excited when you do anything artistic, and you get the opportunity to have a show, it’s amazing. It’s really challenging as a human being both publicly and personally to be criticized. I think that has been the most challenging part of my job, and something I wasn’t prepared for. I’m a person who likes people to like me, and when you’re the boss you have to expect there will be people who never like you. We’ve now mentioned the Jenna transformation arc that dominated the third season a few times: did you know going in that the storyline would be so divisive, and a lightning rod for criticism? LI: No. I thought it was such an interesting, truthful story. I thought it was so clear what we did, if you really go back and rewatch the season after seeing the finale. We were almost finished writing the whole season by the time we aired Episode 301, so it wasn’t like I did any about face: the second half of the season wasn’t at all rewritten outside of introducing the character of Devon based on a network note to keep Matty from seeming like a sad sack. We wanted to see Matty become the new Jenna, to see him actually be alone and not see him fall into new girl territory until the end of the season, until he had healed in his feelings for Jenna. So the Devon character, albeit played by a wonderful actress, was something we shoehorned in based on a note. Regarding Jenna’s transformation, I started to see that I was still telling a story that I fiercely believed in that I didn’t think I had to defend, and yet I started defending myself. It was painful, because it was almost as if on a personal and critical level everyone was forgetting what I had done with the show. These were my feelings, but I felt I was being treated like persona non grata—I’m a strong person who can endure criticism, and that’s not the reason I left the show. That’s just part of putting yourself out there, and it’s a beautiful part of putting yourself out there. But it was painful: it was painful to me, and I felt really misunderstood. There was no way for me to explain myself except when I knew I was leaving, and I was still writing the finale—that finale is reflective of so many things I was feeling as I was writing it.